This morning, my colleague Megan Reynolds alerted the Jezebel staff to a disturbing piece of information. Someone thinks they can make ranch dressing—a perfect condiment—better than it already is. This is a fool’s errand, I said to myself, taken aback at my desk. This person or persons are setting themselves up for failure. The report of the allegedly new and improved ranch dressing came from the New York Times, which says this iteration on America’s favorite dip comes from “a company that imports black truffles from France and sells them to restaurants.” This intrigued me, and in fact, gave me some relief. Of course a black truffle company would think of putting black truffles in ranch. When you’re in the business of importing and selling truffles, everything’s a mark. But this attempt at upselling ranch—which is a paragon of tanginess, creaminess, and utterly delicious flavor—is woefully misguided and, in my opinion, a total tragedy. Does this company understand why people buy ranch? Ranch is a tall glass of cool water on a hot summer’s day! Let’s say you’re at a sweltering picnic and you have your sunglasses on and you’re sitting on the ground and it’s sweaty and you’re uncomfortable, even though you’re theoretically having a good time. Every item at the picnic is unappetizing. Hot dogs? No thanks. Some hard cheese and crackers? Pass. Then your friend comes in with some ranch dressing and carrot and celery sticks. PERFECTION. The sensation of being nutritious PLUS the immaculate taste of the best dip on the planet? It does not get better than this! 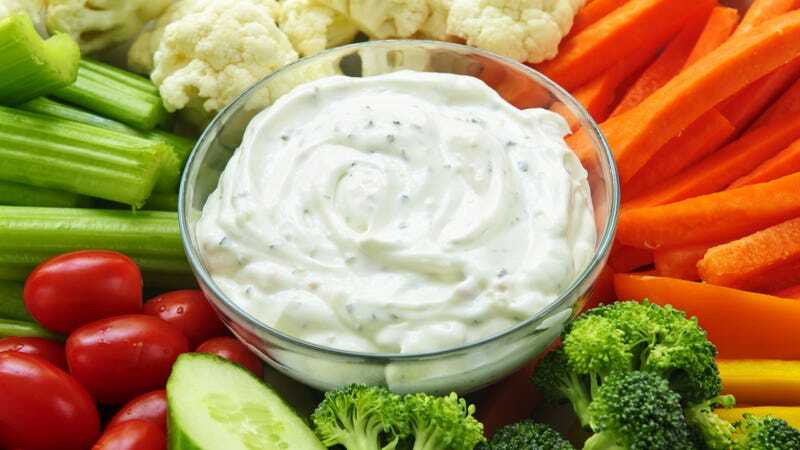 I am partial to ranch as a dip. Some ranch lovers will get funky with it, spreading ranch on a slice of ‘za or adding it to a salad with a base of classic romaine lettuce. I say, that’s fine—be one with your ranch dressing experience. But no one here is picking up ranch and being like, you know what this needs? This needs to be different. NO! Black truffles are way off base, but let me stop you before you get any other big ideas: chili flakes (actually, that could be kind of bomb), sea salt (no need), harissa (a perfectly good condiment that doesn’t need any help from ranch, either), CBD (ha)—these are all needless additions to an otherwise heavenly substance. The market (of ranch-lovers) will show that, in the end. It’s simple: If you think you can improve on ranch, you clearly don’t know ranch. Ergo, you have no business entering the ranch dressing business. Stick to what you know like me, whether it’s truffle oil or excellent blogs.